Your bike needs maintenance, but you can’t reach everywhere you need to by crawling around on the floor. You’re going to need to buy a motorcycle jack to jack up your bike and do some serious work. Picking out a jack from the crowd can be tough, however. Most jacks seem like they are more or less the same. Not all jacks have the features you want, however. In this article, we’ll go over a handful of the best motorcycle jacks on the market so that you’ll know which ones are the best for what you need. #1 Pick – Extreme Max 5001.5044 Wide Motorcycle Scissor Jack – 1100 lb. What Should I Look For In A Motorcycle Jack? How Long Should I Expect My Motorcycle Jack To Last? Does The Jack Method Matter? 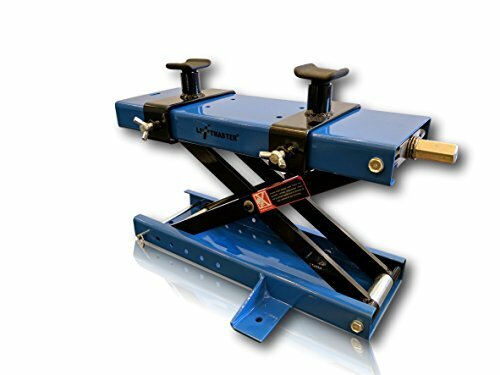 The Extreme Max 5001.5044 Wide Motorcycle Scissor Jack – 1100 lb. has no frills, but it has everything that you will need to jack your bike. The Extreme Max can jack your bike up to 14 inches high using a scissor-style mount. While this jack is a bit of an eyesore, it has a lifting capacity of 1100 lbs. This means that you can jack the heaviest Harley that you can find without any trouble. Despite its extra wide frame, this jack won’t be useful for jacking trikes or golf carts. It’s wide, but not wide enough to perform these other tasks safely. As far as quality of life features go, you’ll need to use a ⅞” socket to use this jack. You will exert yourself a bit, so it might not be the best jack for daily use. The jack itself is relatively light at 27 lbs, however, so if you need to move a jack around a lot for some reason this jack might work. You can purchase a dolly for this jack to make movement even easier. While your bike is jacked up, the rubber padding on the bottom of the jack will prevent any unwanted scratches. You’ll also find that the rubber adds a bit of stability. The only problem with this jack is that it can be difficult to balance a bike. While taking standard precautions will keep you safe, there are probably safer jacks out there. 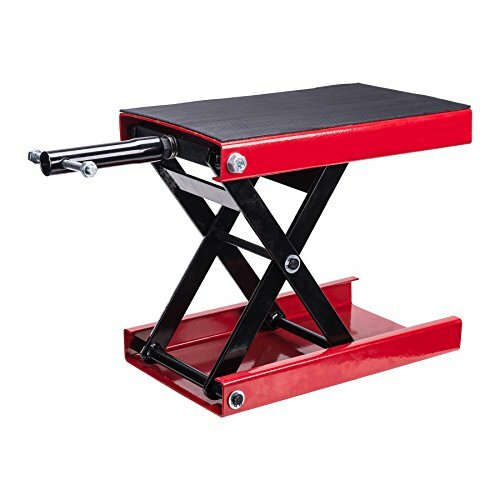 The LiftMaster 1100 LB Motorcycle Center Scissor Lift Jack with Safety Pin Hoist Stand Bikes ATVs is a technological and aesthetically appealing jack which has a handful of safety features that you will be grateful for. This jack is capable of lifting 1100 lbs up to nearly 16 inches in the air before adding the saddles or adapters. The saddles and adapters will each add about three or four inches, so the maximum jack height of this jack is ideal for people who have trouble getting under the bike with normal jacks. The jack utilizes screw adapters for height adjustment. There are two screw adapters, which means that you will need to perform two actions to adjust the height. For experienced users, the added action is a hassle. For amateurs, the second screw makes for a jack which is twice as safe. Cranking the jack can get a bit tiresome because of the additional weight of the top part of the jack. Thankfully, the main safety pin locks in automatically when you would expect it to. This is a very safe jack as a result. The jack itself is not very mobile. Though it can be mounted on a dolly, the jack itself does not fold, nor is it light. The heavy-duty construction of the joint at the base of the jack is the biggest offender which other jacks might not have. Nonetheless, this is a very high quality and safe jack which is great for home shops. 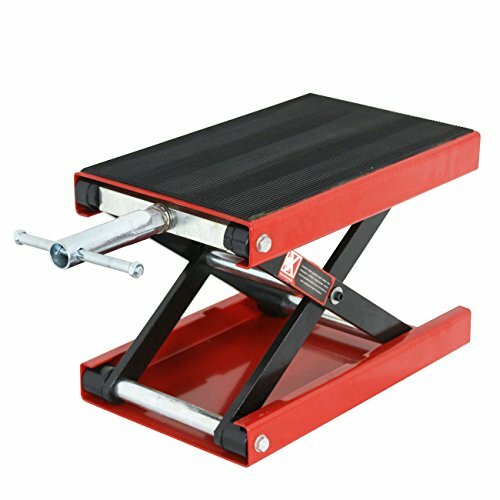 The ZENY 1100 LB Wide Deck Motorcycle Center Scissor Lift Jack Repair Hoist Stand Bikes ATVs, Motorcycle Dirt Bike Scooter Crank Stand is a simple but effective jack with a compact footprint. This ZENY jack is a standard motorcycle jack which is a bit smaller than others around the base thanks to its lack of mounting features. The lack of mobility options for this jack is its biggest downfall. While it can be mounted loosely in a dolly, it isn’t possible to secure it into a dolly, which means that it gets jostled around. This is a minor annoyance, but to someone looking for the perfect jack experience, it is a detracting factor. The manually operated jack handles are better than what most would expect from a jack of this size. The handles are comfortable enough for quick and rapid jacking without any outside aid, and the chrome adds a nice touch. Unfortunately, you won’t be able to use any outside assistance when it comes to raising your motorcycle using this jack. Only manual force will do the trick. This means that it’s a better jack to keep in your pickup truck than in your shop, where the lack of automation will become an annoyance. 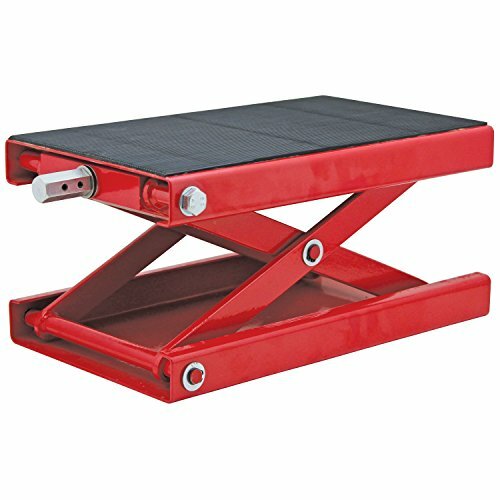 The OrionMotorTech Dilated Scissor Lift Jack for Street Bike, Cruiser, Adventure Touring Motorcycle is a lightweight scissor style jack which is best for lighter motorcycles. The OrionMotorTech jack can jack up to 1000 lbs to a maximum height of 13 inches. This means that you won’t be able to do the highest or heaviest jacks with this unit, but it’s more than sufficient for a lighter cruiser motorcycle or a dirt bike. The minimal bottom joint of the jack is the secret behind its lightweight. The external rivets are a giveaway that this jack is not intended to last 20 years or to lift heavyweight motorcycles. While the durability of this jack is not a concern, you may be a bit more concerned by the jack’s lack of safety features. Motorcycles may be unbalanced while on this jack despite the rubber padding and scissor style struts. At the same time, there aren’t any major safety features on this jack. The metal sleeve is easy enough to use when it comes to raising the platform and jacking the motorcycle. You will need to apply more force than you might with other metal sleeve style jacks, however, so be sure to eat a good breakfast. The Black Widow Steel Motorcycle Jack – 1,100 lb. Capacity has all of the features that you would want from a motorcycle jack, including looking like it’s ready for serious business. 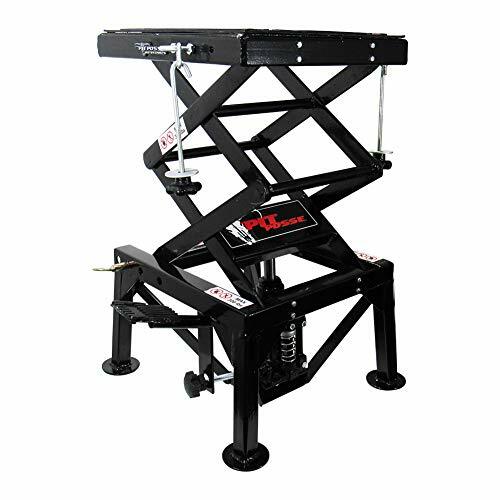 The Black Widow jack is one of the most competitive motorcycle jacks on the market owing to its 16-inch jack height, 1100 lbs capacity, and 3-inch bonus height provided by the struts. This jack is ready for anything, and it’s ready to look cool in the process. The jack is raised via a hex key, which works well and with less effort than one might expect. The black powder coating on the jack gives it a scratch-resistant veneer which is welcome in a shop that services a lot of bikes. You can easily mount this jack on a dolly for mobility, and the strong mounting system makes for an easy mounting on a floor clasp as well. The only disadvantage of this jack is its balancing. The motorcycle is necessarily very high in the air with this jack, and if you don’t secure it using the mounting system on the top of the jack, the thin base means that the motorcycle could technically be prone to tumbling laterally. There is a solution, however. Mounting this jack on a floor clasp will prevent any kind of balance issues. So, while this jack could be mobile, it is at its strongest when screwed into the floor and when all of its mounting features are used simultaneously. Under these conditions, it is the ideal jack. 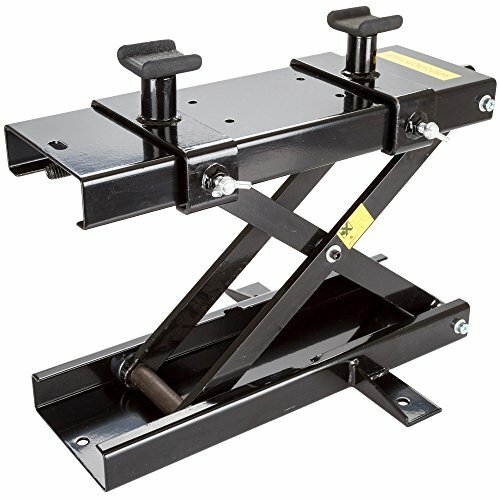 The Extreme Max 5001.5038 Hydraulic Motorcycle/ATV Jack – 1700 lb. Capacity is the jack which is ready for the heaviest of jobs. With this jack, you’ll get a maximum jack height of nearly 15 inches at a maximum capacity of 1700 lbs. You won’t need to purchase a separate dolly or saddle pads, either. This jack also has a conveniently long jacking handle, which makes the heaviest jacks effortless. The jack’s construction may appear to be light-duty, but in fact it’s more than sufficient for years of jacking. The jack also offers superior access to the most difficult-to-reach portions of the motorcycle as a result of its skeletonized design. You’ll never need to worry about instability or accessing a tough area. The main drawback of this jack is that it takes up a lot of floorspace. It isn’t compact whatsoever, and it can be very tough to fit it in a car or truck for transportation. The main problem is the jacking handle. The jacking handle is responsible for the jack’s impressive weight capacity and easy jacking. But it’s also massive, which makes it a bit awkward to move around or store. This makes the jack better suited to stationary work in the shop than mobile work at the track or anything similar. 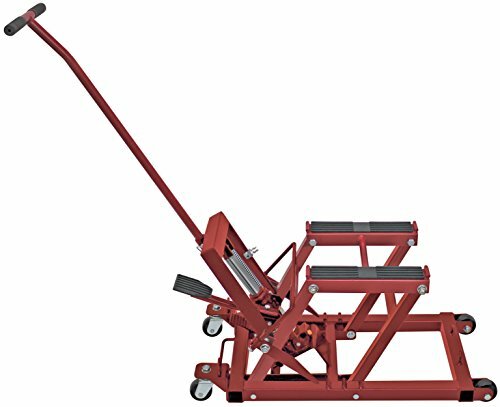 The Pit Posse PP2551 Motorcycle Cycle Dirt Bike ATV Scissor Floor Jack Lift Center Stand is the stablest jack of them all. The Pit Posse uses a unique design that places the jack at the center of a table-like frame. You jack the motorcycle using the floor pedal, which requires a bit of pumping. Once the motorcycle is jacked up, you can adjust the angle with the side knobs, which can also lock for added stability. While this jack doesn’t have any rubber padding designed to make the bike slip-proof, you won’t miss it. The large and square shape of the jack’s top makes for an extremely stable mounting of any cycle. The base of the jack is as important as the top. The four legs of the jack have disc-shaped feet which make for a rock-solid base. The main issue with this jack is its lack of portability and its relatively short jack height. Stability is incompatible with height most of the time, so this issue makes sense. Portability is a problem because the jack can’t be fit onto a dolly or mounted onto one cleanly. The most important features in a motorcycle jack are jack height, ease of jacking, and stability. If your jack doesn’t raise the cycle high enough for you to perform the work you need, it’s useless. Likewise, if the jack is so hard to raise that you’re winded by the time your motorcycle is ready to work on, it won’t be much good if you intend to use it frequently. Stability is also a core safety feature. If your motorcycle falls on you while you are working on it, you may be seriously injured. Not all jacks have the same set of safety features. Many are intended for professional use, and so they have fewer safety features in the name of faster use. If you are an amateur, you will get the best results from a jack which can jack high very easily and with extreme stability. Typically, you will have to pick two of the above three traits. Height is usually incompatible with stability, and ease of jacking is usually incompatible with height, but not always. Figure out the best combination for you and your bike. Most motorcycle jacks will last for five or ten years with heavy usage. The durability of the jack itself is not a major concern most of the time, though many of the jacking mechanisms may have manufacturing defects which causes them to fail within a few years. Most jacks have warranties of several years to account for these issues, so don’t be afraid to consider the warranty as an important purchasing factor. Jacks don’t necessarily wear out significantly faster with heavier usage. You probably will need to perform a little lubrication if you use your jack all the time. The jack method determines the ease of jacking. The most basic jacking method is the metal sleeve, which necessitates a lot of twisting with both of your hands. The metal sleeve isn’t an inferior jacking method because it is very reliable. The only problem is that it doesn’t offer very much height per unit of your physical work. So, if you’re a bit out of shape, the metal jacket isn’t a great way to jack. Similarly, the floor pedal is a very popular jacking method which requires a lot of work to get any appreciable amount of height. Some people find the floor pedal preferable to the metal jacket, however. Finally, the lever or hex key jacking methods are usually the best. The lever might seem like it takes a lot of work, but it’s the easiest method in terms of total effort expended. The longer the lever, the better. The hex key can be as effective as the lever, but is limited by the need to have the right hex key on hand. Not all jack manufacturers sell you the right hex key bundled with the jack, so you may need to purchase one.